This part of the C++ with Qt tutorial is about basic forms of data input in console (terminal) programs. In order to store the input and to process it inside the program, we also need variables, so I'll start with an introduction to variables here. In the examples for formatted output with “sprintf()” and single character output with “putc()” in part 3 of this tutorial I already used some variable definitions. Variables are needed if you want to process any kind of data, either data which is read into the program as an input, or data which is part of some kind of computation. In any C or C++ program, a variable can be defined by a variable type keyword like “int” (for integer) or “char” (for characters), followed by a blank space and the variable name. This is followed by either a comma if further variable definitions follow, or by a semicolon, which closes the variable definition. If no initial value is assigned, the variable automatically is assigned a default value that depends on the data type of the variable. Numeric variable types like “int”, “float” or “double” usually have an initial value of zero, while character-based variables like single characters or strings are initialized with either a blank space or a “zero-character” literal. You will find more information about different data types in a later part of this tutorial. Any variable definition inside a program is translated by the computer, just like any other code command. In the case of a variable definition, the computer reserves a piece of memory (inside the RAM) when the program is running. The internal address of this memory is assigned to the variable name. The amount of the reserved memory depends on the data type of the variable. Any value that lies within the boundaries of the used data type can be stored inside the reserved memory location. If an initial value is assigned to the variable, this value is automatically stored inside the reserved memory location. When you exit from the program, the reserved memory is freed up again – unless some very specific circumstances stop this process or the program does not terminate properly. For standard data types, we can safely assume that the memory is freed up properly. The free memory parts can then be used by other programs or for a new start of the same program. In order to read in some text as a direct keyboard input from the user, we need to define a character or string variable that stores the input. This redirects data from the standard input stream – which is direct keyboard input inside the current terminal window - into the memory location allocated to the “username” variable. In order to stop the input, you only have to press the return button. The downside of this form of input is that any data is only transferred into the storage variable up to the point where there is a blank space. So if you input several words separated by blank spaces, only the first word is stored inside the variable. This allows us to enter the full first and last name(s) separated by blank spaces as the username. As before, the input is terminated by pressing the return or enter button. The third option of reading an input string is the “getstr” function from the classic C language. However, its proper use requires some understanding of pointers, which are a little more tricky to use than other types of variables. I’ll leave this option for a later part of this tutorial. Apart from complete strings, single characters can also be read in from the keyboard input with the help of “cin”. Just like a string input, the data which is entered by keyboard is transferred into the variable after the enter key is pressed. Due to the variable type “char” however, only the very first character is stored. Any additional input is ignored. As a second option, there is also a “getc” function which reads in a single character, similar to the “putc” function for output of single characters. This function reads a single character from the defined input stream which is passed as a parameter, and returns the value of the character. If you start this program, it should print out the questions about your favorite characters and read in three single characters. At the end, you should see a final sentence with a list of the characters you entered. Strange, isn’t it? It seems that the second character input is skipped and only the first and the last input are used. This is actually caused by the default behavior of the standard input and output streams. 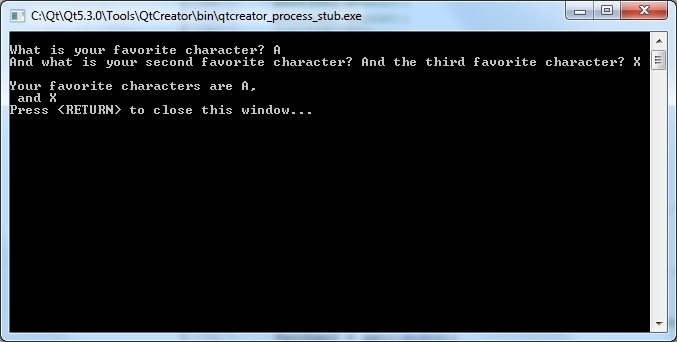 When you enter the first character using “cin”, you have to press the enter/return key in order to terminate the input. Even if you really just entered one character, the return key automatically enters a second character, namely the “newline” character (ASCII value “10”). This is stored in the standard input stream, but not directly read in by the program. Once the program executes the “getc(stdin)” function, the stored newline character is read in from the input stream, before you can enter another character. So the second input seems to be skipped, and you can only enter the third and last character before the list is printed on the screen. The above statement deletes any data from the standard input stream (stdin) which has not yet been processed. So in the case of our little character input program, it deletes the newline character and anything else that may have been entered after the first input character. Now when you run this modified program, it operates like expected, waiting for you to enter each of the three single characters. The "fflush" function can also be used for other types of streams. It's useful if you want to be sure that any previous and unwanted data from the stream in question is deleted before you start with the proper processing of the input or output. As a last addition to input and output, let's have a look at string streams. By adding the "sstream" library to your program as an additional standard include ("#include <sstream>") you can add a stream function called "stringstream" to the program. This function allows any string to be handled like a standard input stream. By doing this, the stream operator ">>" can be used to extract data from a string and copy it into a variable of another type, thus converting it. In this example, the strings entered for the price and amount of apples are converted into a float and an integer value. With these kind of variables, arithmetic operations can be performed, so the earnings can be calculated. If you use unconverted strings instead, you can output the strings, but cannot use them for any calculations. There are also some other ways to convert values from one data type into another, but the "stringstream" is an easy way to do it if you have strings that contain the data to be converted. I hope you could follow me so far. I have added the code from the examples above to the "Console_IO" subdirectory within the tutorial repository on GitHub, so if you download it from there (as a ZIP archive or a git repository), you can experiment with the code. In order to give you some additional insight about the handling of different kinds of variables, the next part(s) of the C++ with Qt tutorial will focus on this area.